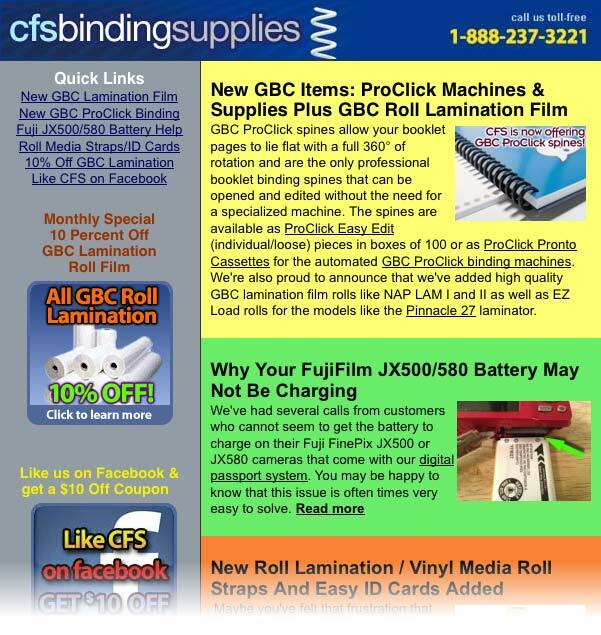 Our August newsletter features announcements about GBC (General Binding Corp.) products that we have recently added – ProClick spines and GBC ProClick machines are now available at www.cfsbinds.com. Additionally, all GBC roll lamination film is on sale for 10% off through the month of August. For those who may have experienced issues with their passport system camera’s battery not charging, we’ve added a new helpful blog article. Another batch of cool items that we now have are the vinyl/lamination roll Z-Straps, Sooper Clips & Core ID Cards – these handy accessories allow to easily and safely keep your rolled material from unwinding and help you to identify each material.